Thanks to our friends at DCBeer.com, when you catch a Washington Nationals baseball game, you'll also be able to find a good beer. 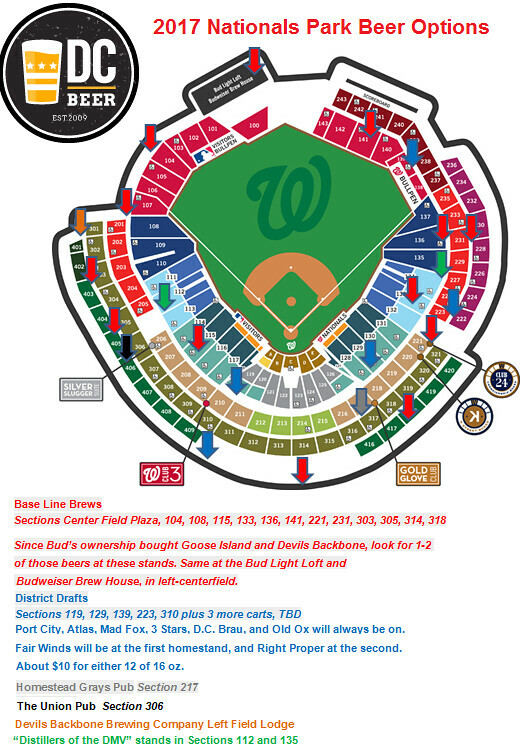 They've just published this convenient 2017 beer map of Nationals Park, in Washington, D.C. Sections 119, 129, 139, 223, 310 plus 3 more carts, TBD. Plus 2 rotating taps for other local beer. (For example: Fair Winds will be at the first homestand; Right Proper, at the second). In addition to the normal flotsam and jetsam sold by beer vendors (Budweiser, via Anheuser-Busch, is the official team beer partner), tallboy cans of Maryland's Flying Dog Brewing's Snake Dog IPA may also be found here and there. Cans of Virginia's Port City Brewing Optimal Wit will come later in the season. Center Field Plaza and Sections 104, 108, 115, 133, 136, 141, 221, 231, 303, 305, 314, 318. The Nationals moved to town in 2005, playing in old RFK Stadium. They moved into their new digs, Nationals Park, in 2008. It wasn't until 2013 —due to the efforts of Bill Butcher of Port City Brewing and Bill Madden of Mad Fox Brewing, among others— that good local beer, via the District Drafts carts, became a regular, easily accessed thing at the Park. Ain't the beer cold, hon! For years, YFGF's home base had been the DC/Baltimore/northern Virginia conurbation. Now, although in Atlanta Braves territory (who this year perversely reverse-migrated out of its downtown to its suburbs), I offer no apologies for rooting for the Washington Nationals first, Baltimore Orioles second. The Nats defeated the Miami Marlins 4-2 at home for their Opening Day game; in payback for last season's postseason, the Orioles defeated the Toronto Blue Jays, 3-2 in extra innings. I'm certain that DC Beer will update the map as beer-scouting reports come in. In years past, uber-fan Charlie Fliegel has done the cartography honors at his Nationasl Review. See this beer map, for example, from 2016.